Heat broiler (or toaster oven). 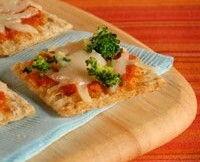 Place 8 square whole-wheat crackers on a broiler-proof (or toaster-oven) baking sheet. On a lightly floured surface, roll and stretch dough into a 12-by-16-inch oval (or as large as will fit on baking sheet); transfer to sheet. Dividing evenly, top crackers with 3 tablespoons jarred marinara sauce and 3 tablespoons shredded part-skim mozzarella cheese. Top half of the crackers with 1 tablespoon thawed frozen chopped broccoli. Broil until cheese has melted, 2 to 3 minutes.